After working for 20 years as a professional activist, Ken Ward determined that much of his life’s work wasn’t solving a problem that he says threatens civilization itself: climate change. 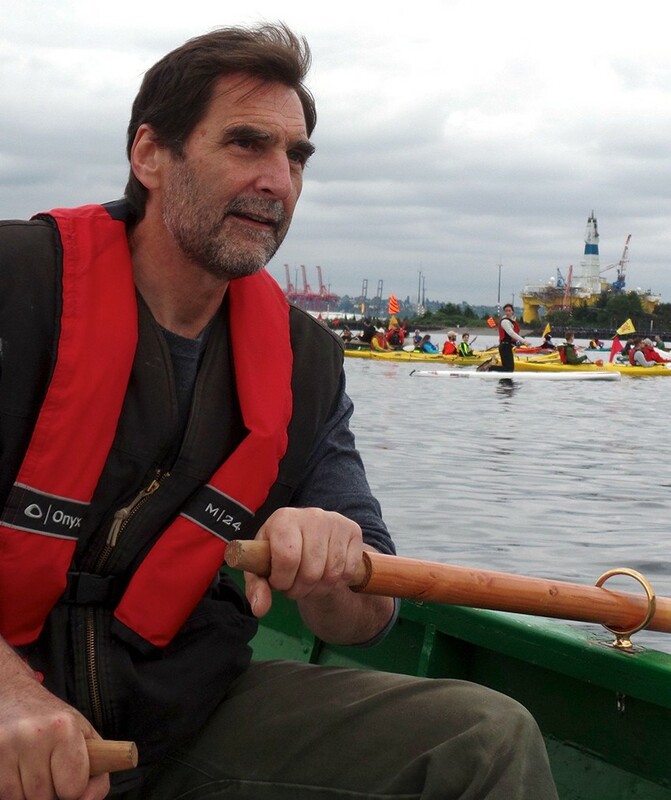 In May 2013, Ward, who went on to found the Climate Disobedience Center, co-piloted a lobster boat to block coal from being delivered to a coal plant in Massachusetts. He now says the problem is so urgent that it’s time for other people to physically put themselves in front of vehicles transporting fossil fuels. On Saturday, Ward will be in Spokane with other like-minded activists to talk about their work. The Inlander spoke with Ward by phone about his controversial solution in anticipation of his visit to Spokane this weekend. His remarks have been edited for clarity and brevity. Inlander: You’re best known for using a lobster boat to block a shipment of coal. What made you decide to do that? Ken Ward: Well, I’d been working for over 10 years on climate change through legal means, and I didn’t see any any effective response. Partly because we hadn’t come to grips with the scale of the problem and that’s still the problem. At this point we have the arctic ice shelf in unstoppable collapse. The only question is how fast is it collapsing. We now know that the temperature we’ve seen is enough to put major global systems into collapse. Even the more conservative estimates have land under water by the end of this century. That should be the main topic of our national civic dialogue. It should be what presidential candidate are addressing first. But one party doesn’t acknowledge it, and the other is barely acknowledging it. What difference did your civil disobedience accomplish? It stopped the delivery of 40,000 tons of coal. Mainly what it did is it inspired people to do similar actions across the country and start the beginning of more direct action. Yeah, I was in Massachusetts at the time. I’ve met people who’ve done direct action in Seattle and the Delta-5 folks in Everett, and their actions were inspired by our efforts. So, yes. Why do we need to break laws to accomplish these aims? Well, in my own case, I’ve been working on this for 20 years. I’ve done lobbying I've done litigation, I’ve done campaigning and none of those things get to the scale of the problem. Once you conclude that civilization is threatened what else can else can you do? Significant changes usually require people to step outside of business as usual. How will this play out if we have large-scale civil disobedience with blocking trains? The main thing is it does is it changes the political equation. It forces our political system to deal with the problem. We can’t as individuals or communities deal with a global energy infrastructure. So the main thing it does is forces the genuine scientific description of the problem onto the agenda. If it’ll take decades to transform the global energy infrastructure, isn’t this a no-win scenario? It’s a matter of mitigating how bad the bad is. We have to make this transformation as rapidly as possible. But it’s pretty straightforward. We’re spending money to subsidize fossil fuels and agriculture and forest practice. We need government power to mandate a quick shift. Those things can be done, but they are not being considered. After we got bombed at Pearl Harbor, Franklin Roosevelt called in the heads of the major motor companies and said you will stop making cars and start making tanks. The government should say: We will stop mining coal on this date; we will phase out gas and oil on this track; we will invest in these alternative. None of this is easy, but we have to do it. What if everyone who had really strong opinions on whatever social or political issue adopted this technique? Wouldn’t that be chaotic? This one is a moral position, but we are talking about facts. It’s unlikely that people who are for fossil fuels would take a moral stance in favor of burning coal. You used to work for a PIRG. What role do they have? Right now their role is problematic. They are a major part of the problem because they need to offer solutions and show successes that work in the same kind of politics as usual. These incremental things are not going to work. We need something larger. They need to withdraw from politics as usual and start saying this is what’s necessary. Should people in Spokane block oil trains? Ken Ward appears with Jackie of the Delta-5 protests and Matt Fuller of the Shell No! organization Saturday, April 23, at 7pm at the Spokane Community College (SCC) Lair - Student Center. Happy Earth Day! Celebrate our planet at local events this weekend.